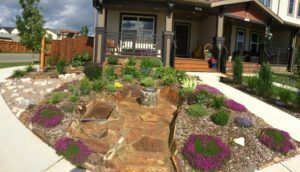 In Cochrane we are fortunate to have such an abundant supply of, and many local suppliers of, beautiful natural landscaping materials. Undeveloped lots are a great source of all sizes and colours of rocks for landscaping. All you need is a wheelbarrow, gloves and muscles (and maybe a shovel). We searched and found some lovely ones and moved them over to our yard in Heartland for use as accent rocks in the perennial garden and for garden bed borders. What’s not to like about free? (And yes we asked permission of the developer). Top Spray is a great source for soil blends and mulch varieties. Cochrane Landscape Supply has a full supply of natural landscape materials and was our source for 1-2 inch bronze flagstone for pathways and patio and 2-5 inch bronze ledgestone for building walls to support flower and herb beds. Inspired by hikes in the Lake O’Hara area of the Canadian Rockies, we incorporated colourful slabs of flagstone in our pathways, steps, bench, and as a bridge over our rock river bed. In the past we have used wood slices or rounds for pathways and a small patio. I don’t recommend them as they are slippery in wet and icy weather and over time they break down allowing seeds and weeds to sprout and grow. 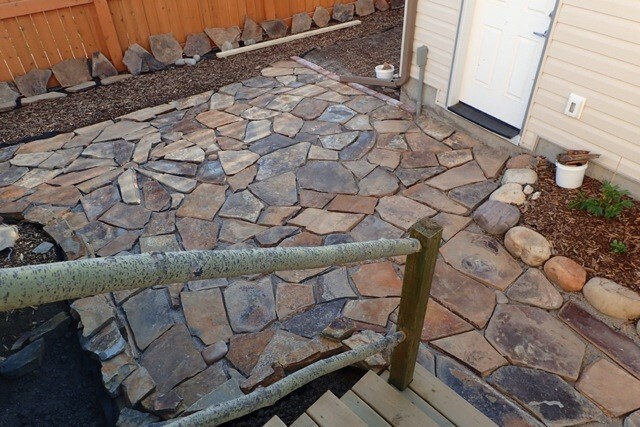 Natural rock, in the form of flagstone for pathways and patios or ledgestone for walls, should last a lifetime. Our rock riverbed is a mixture of purchased stone and locally collected stone. In the planning stages we observed where the water naturally ran off from the downspout. We used this as our outline and dug out the soil layer about 4 to 6 inches. Then we placed double overlapping layers of landscape fabric to block weeds and filled it with 20 mm Montana rainbow rock from CLS. 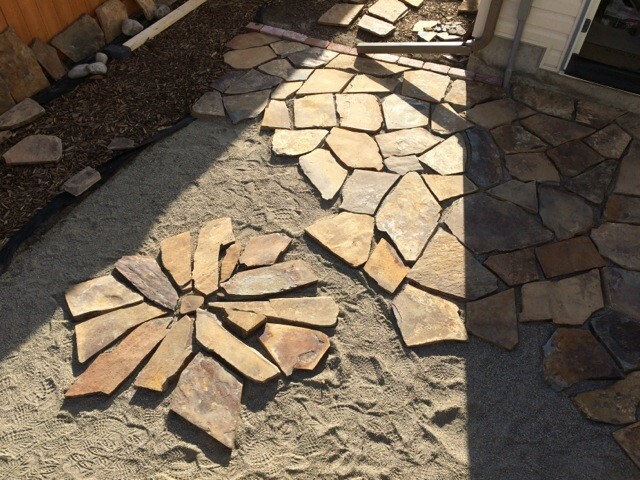 Beautiful accent stones were collected locally and placed in a natural flow. Wood accents such as driftwood pieces, stumps and branches can be placed for aesthetics and to attract birds. Pinterest has some great ideas for using natural materials in the yard. 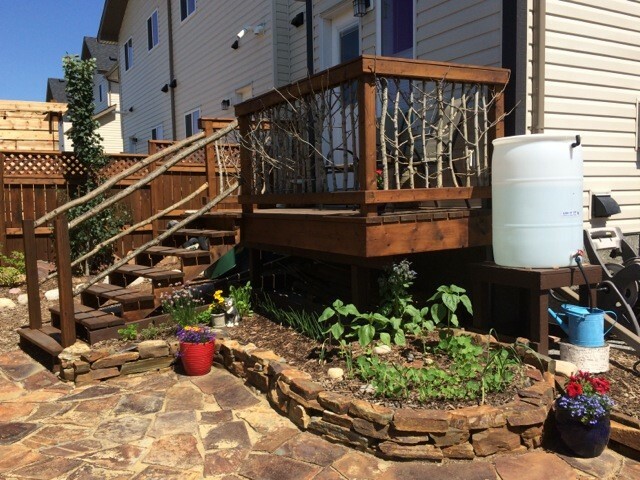 In fact, one idea led us to use aspen instead of diamond willow as balusters for our back deck. Aspen was readily available for the harvesting through a friend’s property and it worked well. 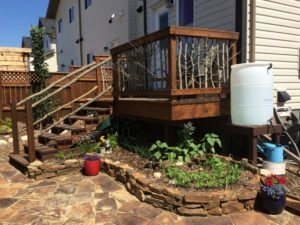 Welcome to our Community Garden Blog. The views and opinions expressed in this blog are those of the authors and do not necessarily reflect the opinions of Top Spray or Spray Lake Sawmills.